The STUDIO has all the necessities for a great beach get-away, including a mini fridge, microwave, coffee makers and a comfy bed. It comfortably accommodates one or two people. Located on the south side, there's an "open space" in front of the house allowing for an ocean view! Free Wireless internet. 1 bedroom, 1 bath lower unit with separate entry. Queen bed. No kitchen, but a microwave, coffee maker and mini refrigerator. Just one row from the ocean on the surf break side. Free Wi-Fi. Very private, one street back from oceanfront. Close to pool, surfing, Jacuzzi and shuffleboard. Full kitchen including refrigerator, freezer, stove with oven, dishwasher, garbage disposal, microwave, coffee pot, blender, toaster and all dishes, pots and pans and cutlery. Patio has gas bar-b-que. Designer linens – queen bed --- also extra queen bed for separate sleeping arrangements. Parking directly in front. Perfect for romantic getaway or two surfer dudes. FREE WIRELESS INTERNET. Charming studio apartment with a fabulous view. Cal King Bed. Fully equipped kitchen with full-size fridge and range. Flat screen smartTV with cable service, close to pool & Jacuzzi. Free Wi-Fi. Suite by the Sea is a newly remodeled downstairs guest suite. 1 bedroom, 1 bath. Mini-fridge with a small freezer, coffee maker, toaster oven and microwave in the kitchenette. Free Wi-Fi & cable TV. Private studio with a full bathroom, memory-foam futon bed, flat screen TV with cable, kitchenette with microwave, refrigerator, coffee maker and toaster oven. Includes linens and towels. Free wireless internet. 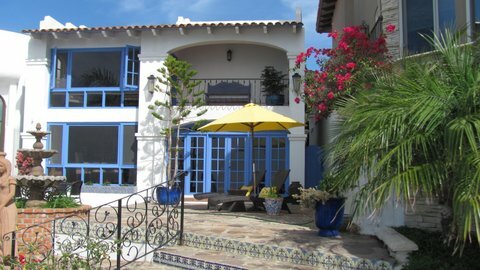 Very private casita behind an ocean front home. Flat screen cable TV. King bed. Kitchenette with fridge, microwave, toaster, coffee-maker, utensils and dishes. Bottled purified water provided. BBQ & FREE WIRELESS INTERNET. No security deposit.